"We chose cooking videos because everyone has done it and understands it," said Professor Yiannis Aloimonos (CS/UMIACS). Aloimonos directs the Computer Vision Lab, is part of the Maryland Robotics Center, and is an affiliate faculty member of the Institute for Systems Research. "But cooking is complex in terms of manipulation, the steps involved and the tools you use. If you want to cut a cucumber, for example, you need to grab the knife, move it into place, make the cut and observe the results to make sure you did them properly." 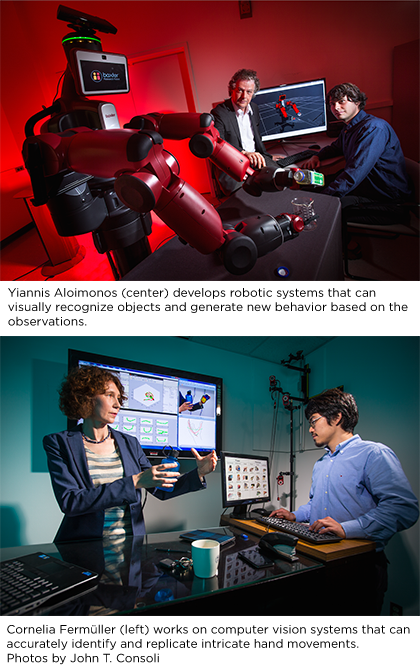 Part of this work was done in the Autonomy, Robotics and Cognition Laboratory (ARC Lab). This lab, headed by Professor John Baras (ECE/ISR), is a new facility formed jointly by ISR and UMIACS. The research was supported in part by a grant from the Office MSEE of DARPA. —Thanks to Matthew Wright (CMNS) and Tom Ventsias (UMIACS) for this story.